Silverhorse Racing louvers are sweet. But, requires some work. Well worth it, though. yeah i really like those too!! do u really have to pop the window out? yes you do.. but i talked to the guy at the super stang fest in daytona fl in june.. he was with the silver horse bus.. and he said its really not that hard..
im sure its deffinately do-able ..
those are mine on the webpage. I had the same problem you have... I couldn't decide which ones and I kept leaning toward the roush (I dont know why) and I'd see something else and I wouldn't know what to get. UNTIL I ran upon these from cervinis. They must be new because i've never seen then before but these are by far my favorite, I'm going to order them in a couple days. 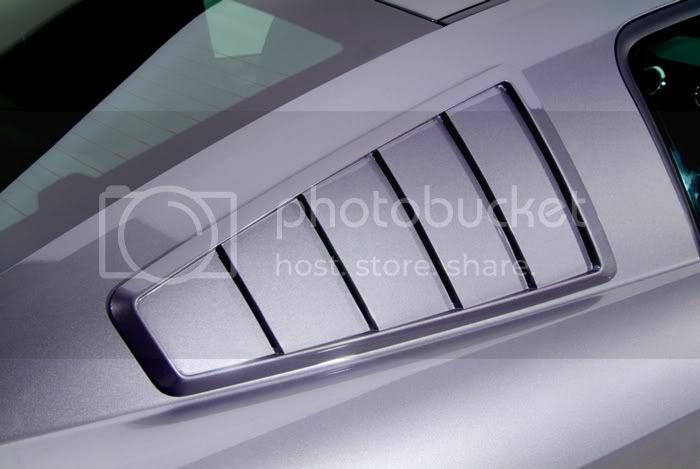 They are called "'65 Window Louvers" from Cervinis. i have these in mineral grey, recieved them in 3 days painted perfectly. I really look forward to seeing these on someone's car. I have seen them on their site, and always hoped someone would put them on. I used to have Saleen louvers on, but could not pass up the deal I got on my CDC's. I love em.